Local anaesthetics are known to produce neurotoxicity at normal doses. Present investigation check the neuroprotective effect of P2X4 receptor antagonist in local anaesthetic induced neurotoxicity. In this study SH-SY5Y neuronal cell was treated with local anaesthetic (bupivacaine) and P2X4 receptor antagonist (Sumarin) at different concentrations. Neuroprotective effect of sumarin was evaluated by estimating cell viability, apoptosis, Reactive Oxygen Species (ROS) accumulation, Caspase 3 and 9 activity and morphological changes. Result of study suggested that treatment with sumarin significantly increases (p<0.01) the cell viability and reverse the effect of bupivacaine. It was observed that treatment with sumarin (100 μmol/l) effectively attenuates the apoptosis, ROS accumulation Caspase 3 and 9 activity and morphological changes induced by bupivacaine (1 mmol/l). Thus present study concludes that neuroprotective effect of P2X4 receptor antagonist in bupivacaine induced neurotoxicity of cell by decreasing the ROS and Caspase activity and thereby decreases the apoptosis of neuronal cell. P2X4 receptor, Neurotoxicity, Local anaesthetic, Apoptosis, Reactive oxygen species. Local anaesthetics are clinically used for the production of anaesthesia, relieving pain associated with post operation and biopsy study . Literature suggested that these drugs are posses’ cytotoxic property, on the basis of which it produces neurotoxicity when applied for spinal anaesthesia clinically [2,3]. It was observed in the reported study that administration of local anaesthetic through cauda equina, intrathecal rout induces apoptosis in neuronal cells by inducing atrophy, degeneration of axon, oedema . Local anaesthetics having higher lipophilicty carry neurotoxic property and evidences links the neurotoxicity associated with bupivacaine administration . There are various mechanisms on the basis of which local anaesthetics induces cytotoxicity/neurotoxicity like apoptosis induced through activation of Caspase pathway, increase in ROS production, mitochondria injury, tyrosin kinase enzyme inhibition, blockage of Na+ ion channel, increase in release of calcium from rough endoplasmic reticulum and activation of p38 Mitogen-Activated Protein Kinases (MAPK) etc. [6-8]. Even hyerexcitability of the neuron is one of the factors responsible for neurotoxicity induced by local anaesthesic . P2X4 receptor is related to neuropathic pain and induces injury by up regulation of MAPK and thereby activates the release of brain derived neurotropic factor in neuronal cells . Thus P2X4 receptor activation produces hyper excitability of neuron and neuronal injury . Previous studies reported that P2X4 receptor antagonists reduces the ROS production and cytokine level, thus decreases the oxidative stress . It also inhibits the apoptosis of neuronal cell by activating the Caspase pathway and decreasing the activation of MAPK . P2X4 receptor antagonists have also maintained the neurochemical level in the brain tissues and thereby used in the management of epilepsy . Anticonvulsant drugs reported to have neuroprotective in local anaesthesic induced neurotoxicity . On the basis of these facts it is worthy to assess the neuroprotective effect of P2X4 receptor antagonists in local anaesthesics induced neurotoxicity. Neuronal (SH-SY5Y) cell line was procured from Shanghai Institutes for Biological Sciences, Shanghai, China. In a 5% CO2 humidified incubator at 37˚C cells lines were incubated. DMEM medium was used with (10% v/v) foetal bovine serum, penicillin (100 U/ml) and streptomycin (100 μg/ml) as a culture medium for the present study. MTT assay was used to asses’ cellular viability. In which cell (5 × 103 cells/well) were placed at 96 well plates and treated with bupivacaine for the period of the duration of 3 days. MTT assay was performed as described by Xiao et al. MTT (50 μl) was added to the well plate and keep it for incubation for 4 hr. at 37˚C. Thereafter from the reaction mixture supernatant was washed out and subsequently dimethylsulfoxide (200 μl) was added to all the well plate at room temperature. The absorbance was estimated at 570 nm wavelength . Neuronal cells were placed (5 × 103 cells/well) in 96-well plates. Cell plates were treated with suramin 25, 50 and 100 μmol/l for the duration of 6 hr, thereafter media was treated with 1 mmol/l bupivacaine for the duration of 1 day. CCK8 was poured in to each well plate for the period of 3 hr and optical density of the plate was read at a wavelength of 450 nm by spectrophotometric analysis . Apoptosis of cell was assessed by apoptosis assay in which SH-SY5Y cell lines (1 × 106 cell/well) placed for 1 day in 6 well plates. Cell plates were treated with suramin 25, 50 and 100 μmol/l and bupivacaine for the period of the duration of 2 days. Apoptosis of cells were estimated as per the instruction given by manufacturer (BD biosciences) by using apoptosis detection kit. In all the well plate Annexin V-FITC of 5 μl was added and kept it for 10 min at 37˚C for incubation and thereafter Propidium Iodide (PI) at a volume of 5 μl was added to it. Flow cytometer was used for the estimation of cell apoptosis . SH-SY5Y cell lines (1 × 106 cell/well) were placed for 1 day in 6 well plates and separated into four different treatment groups such as control, bupivacaine (1 mmol/l) treated group, suramin (100 μmol/l) and suramin (100 μmol/l) for 6 hr subsequently bupivacaine (1 mmol/l) for 1 day. ROS accumulation was estimated by DCFH DA fluorescent dye. Cells of all the groups were incubated with DCFH DA for the duration of 20 min at 37˚C and then cells were washed with PBS for 3 times. After washing all the cells were resuspended with PBS and flow cytometer used for the estimation of ROS accumulation . SH-SY5Y cell lines (1 × 106 cell/well) were placed for 1 day in 6 well plates and separated into four different treatment groups such as control, bupivacaine (1 mmol/l) treated group, suramin (100 μmol/l) and suramin (100 μmol/l) for 6 hr subsequently bupivacaine (1mmol/l) for 1 day. Activity of Caspase 3 and 9 was estimated by as per the instructions of Caspase 3 and 9 kit (Tiangen Biotech). All the cells were incubated for 30 min by keeping it with cell lysis buffer. BCA protein reagent was used for the estimation of concentration of protein. Estimation of Caspase 3 and 9 was achieved using micro plate spectrophotometer (Bio Rad Lab., CA, USA) at a wavelength of 405 nm . Neuronal cells were treated in the same way as described in ROS measurement and after washing with PBS and fixed by using 2.5% glutaraldehyde for the duration of 1 hr at 4C and lead uranium was used for the staining of it. Transmission electron microscope was used for the observation of ultrastructure of cell . All the values of these experiments were articulated as mean ± SD and the data was statistically analysed by one-way ANOVA and thereafter applied to Dunnett post hoc test. p<0.05 was considered significant statistically. MTT assay was used for the estimation of toxic effect of bupivacaine on SH-SY5Y neuronal cell line as shown in Figure 1. It was observed that bupivacaine at dosage 1, 1.5 and 2 mmol/l significantly decreases the viable cell compared to control (0 μmol/l). Figure 1. Cytotoxic effect of bupivacaine on SH-SY5Y neuronal cell line by MTT assay. Values are mean ± SD (n=6), **p<0.01 vs. control group. LD50 of bupivacaine was found to be 1 mmol/l same as that of previous study and therefore it was at this dose used for the induction of cell death. Figure 2 shows the effect of suramin on cellular toxicity induced by bupivacaine by using CCK 8 assay. Treatment with suramin at 50 and 100 μmol/l concentration significantly (p<0.01) attenuates the cytotoxicity induced by local anaesthesic (bupivacaine). Figure 2. Effect of suramin on cellular toxicity induced by bupivacaine by CCK8 assay on SH-SY5Y neuronal cell line. Values are mean ± SD (n=6), **p<0.01 vs. control group. It was observed that suramin shows the cytoprotective activity in a concentration dependent manner. Effect of suramin on bupivacaine induced apoptosis by using Annexin V-FITC detection kit. 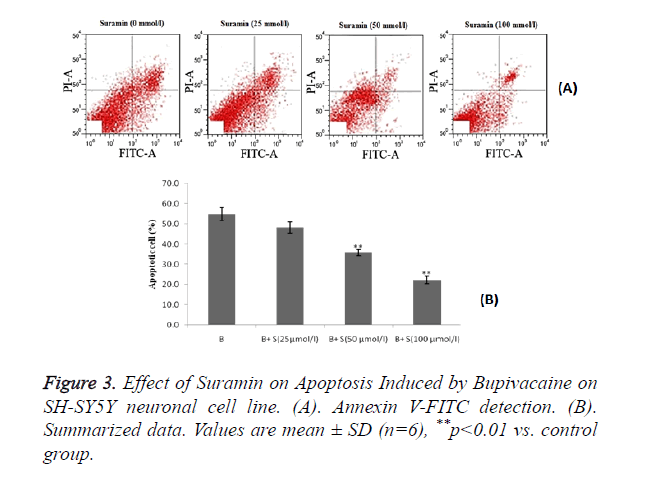 There was decrease in bupivacaine induced apoptosis of neuronal cell by suramin treatment as compared to control group as shown in Figure 3A. Figure 3. Effect of Suramin on Apoptosis Induced by Bupivacaine on SH-SY5Y neuronal cell line. (A). Annexin V-FITC detection. (B). Summarized data. Values are mean ± SD (n=6), **p<0.01 vs. control group. Statistical representation also suggested that treatment with sumarin significantly (p<0.01) decreases the percentage of apoptosis cell induced by bupivacaine compared to control group and these are in a dose dependent manner as shown in Figure 3B. Figure 4 shows the effect of sumarin in ROS production in SH-SY5Y neuronal cells by flow cytometer. It was observed that treatment with sumarin significantly decreases the accumulation of ROS which was increased by bupivacaine treatment. Accumulation of ROS was estimated by DCFH DA fluorescent signals as shown in Figure 4A. Figure 4. 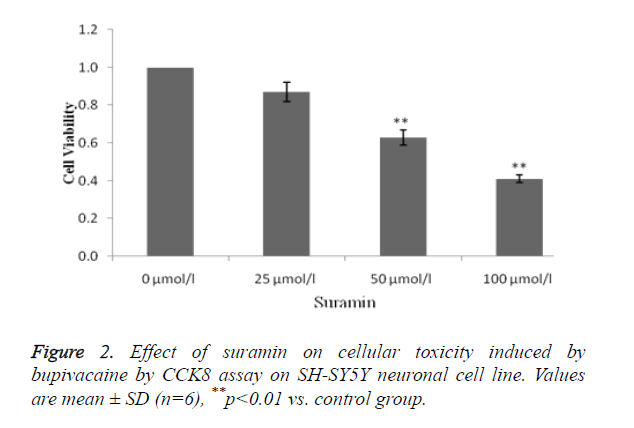 Effect of sumarin on ROS Production in SH-SY5Y neuronal cell line. (A). DCFH DA fluorescent signals. (B). Summarized data. Values are mean ± SD (n=6), @p<0.01 vs. control, **p<0.01 vs. B (Bupivacaine treated). These results demonstrated that sumarin protects the mitochondrial function by reducing the ROS production and increasing the antioxidant capacity. Treatment with bupivacaine significantly (p<0.01) increases the activity of Caspase 3 and 9 protein compared to control group. 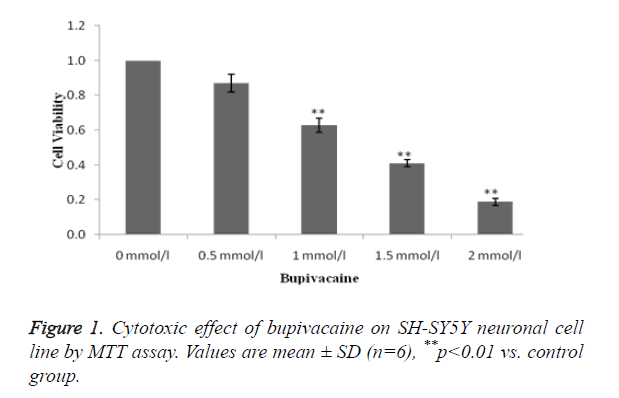 Whereas, treatment with sumarin significantly decreases the activity of Caspase 3 and 9 in SH-SY5Y neuronal cell line compared to bupivacaine alone treated group as shown in Figure 5. Figure 5. 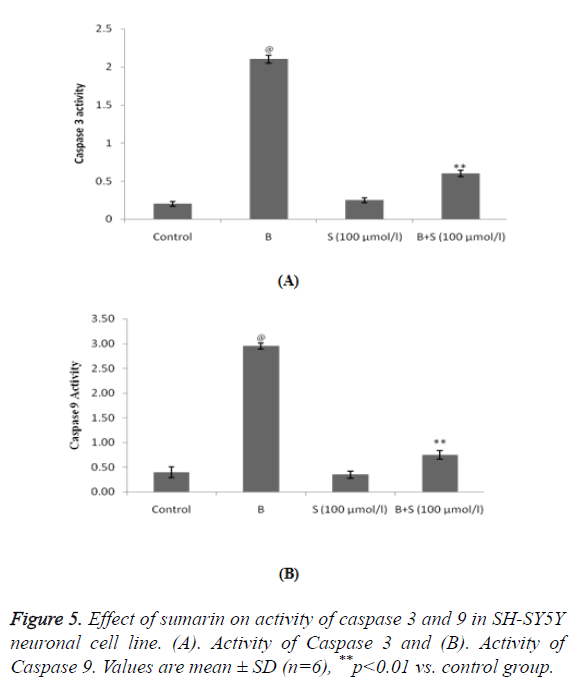 Effect of sumarin on activity of caspase 3 and 9 in SH-SY5Y neuronal cell line. (A). Activity of Caspase 3 and (B). Activity of Caspase 9. Values are mean ± SD (n=6), **p<0.01 vs. control group. Normal cellular structure of SHSY5Y cells were normal regular and endoplasmic reticulum and mitochondrial shape as in TEM image of Figure 6a. Whereas bupivacaine treated group shows swollen endoplasmic reticulum and mitochondria as shown in Figure 6b. Treatment with sumarin appears no changes in the normal structure of cell and its organelles as shown in Figure 6c. Moreover, sumarin attenuates the morphological changes induced by bupivacaine treatment as only slightly swollen in the endoplasmic reticulum as appears in Figure 6d. Figure 6. 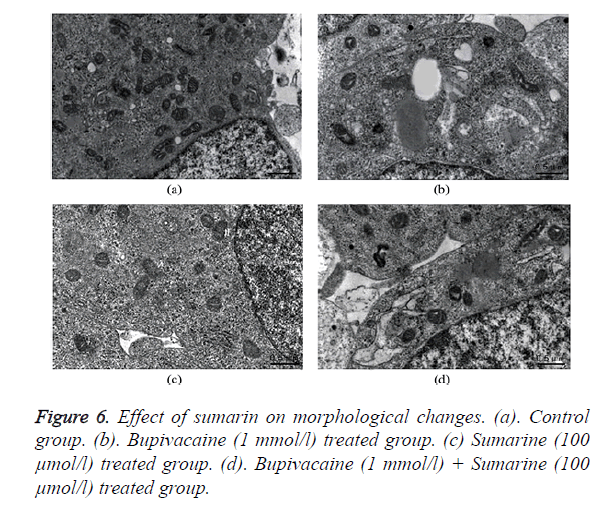 Effect of sumarin on morphological changes. (a). Control group. (b). Bupivacaine (1 mmol/l) treated group. (c) Sumarine (100 μmol/l) treated group. (d). Bupivacaine (1 mmol/l) + Sumarine (100 μmol/l) treated group. In this study P2X4 receptor antagonist i.e. sumarin attenuates the neuronal injury induced by local anaesthesic (bupivacaine). Sumarin protects the neuronal cell by decreasing the apoptosis, ROS accumulation, Caspase 3 and 9 activity and morphological changes induced by bupivacaine in SHSY5Y neuronal cells. Local anaesthesic drugs show neurotoxicity by inducing apoptosis. Apoptosis of cell was activated by extrinsic and intrinsic pathway and bupivacaine induces apoptosis of neuronal cell by activating both the pathway . Excessive ROS production and accumulation increases the oxidative stress and thereby activates apoptosis . Bupivacaine increases the ROS production in the neuronal cell line and treatment with sumarin significantly (p<0.01) decreases the ROS accumulation. Thus sumarin effectively decreases the apoptosis of neuronal cell induced by bupivacaine. Literature also suggested that local anaesthesic activates Caspase and thereby stimulate the cell death through activation of apoptosis . Drugs decreases the Caspase activity attenuates the process of apoptosis effectively . This study suggests that sumarin effectively decreases the activity of Caspase 3 and 9 in SHSY5Y neuronal cells. Even TEM study also demonstrated the protective effect of sumarin on morphological characters of mitochondria and endoplasmic reticulum of bupivacaine induced neurotoxicity in cell. Present investigation concludes the neuroprotective effect of P2X4 receptor antagonist in local anaesthesic induced neurotoxicity. It also postulates the possible mechanism of action of sumarin as it decreases the apoptosis of neuronal cells by reducing ROS accumulation, decreasing Caspase 3 and 9 activity and protecting the morphological changes. Kalichman MW, Powell HC, Myers RR. Quantitative histologic analysis of local anesthetic-induced injury to rat sciatic nerve. J Pharmacol Exp Ther 1989; 250: 406-413. Gibbs NM, Rodoreda P. Primary anaesthetic deaths in Western Australia from 1985-2008: causation and preventability. Anaesth Intensive Care 2013; 41: 302-310. Griffiths JD, Le NV, Grant S, Bjorksten A, Hebbard P. Symptomatic local anaesthetic toxicity and plasma ropivacaine concentrations after transversus abdominis plane block for Caesarean section. Br J Anaesth 2013; 110: 996-1000. Lu J, Xu SY, Zhang QG, Xu R, Lei HY. Bupivacaine induces apoptosis via mitochondria and p38 MAPK dependent pathways. Eur J Pharmacol 2011; 657: 51-58. Sawaki K, Ohno K, Miyamoto K, Hirai S, Yazaki K. Effects of anticonvulsants on local anaesthetic-induced neurotoxicity in rats. Pharmacol Toxicol 2000; 86: 59-62. Perez-Castro R, Patel S, Garavito-Aguilar ZV. Cytotoxicity of local anesthetics in human neuronal cells. Anesthes Analges 2009; 108: 997-1007. Arai Y, Kondo T, Tanabe K. Enhancement of hyperthermia-induced apoptosis by local anesthetics on human histiocytic lymphoma U937 cells. J Biol Chem 2002; 277: 18986-18993. Cela O, Piccoli C, Scrima R. Bupivacaine uncouples the mitochondrial oxidative phosphorylation, inhibits respiratory chain complexes I and III and enhances ROS production-results of a study on cell cultures. Mitochondr 2010; 1: 487- 496. Abed WT. Alterations of lidocaine and pentylenetetrazol-induced convulsions by manipulation of brain monoamines. Pharmacol Toxicol 1994; 75: 162-165. Gum RJ, Wakefield B, Jarvis MF. P2X receptor antagonists for pain management: examination of binding and physicochemical properties. Purinergic Sig 2012; 8: 41-56. Ulmann L, Hatcher JP, Hughes JP, Chaumont S, Green PJ, Conquet F, Buell GN, Reeve AJ, Chessell IP, Rassendren F. Up-Regulation of P2X4 receptors in spinal microglia after peripheral nerve injury mediates BDNF release and neuropathic pain. J Neurosci 2008; 28: 11263-11268. Hung SC, Choi CH, Sadier NS, Johnson L, Atanasova KR, Sellami H, Yilmaz Q, Ojcius DM. P2X4 assembles with P2X7 and pannexin-1 in gingival epithelial cells and modulates ATP-induced reactive oxygen species production and inflammasome activation. PLoS One 2013; 8: e70210. Ulmann L, Hirbec H, Rassendren F. P2X4 receptors mediate PGE2 release by tissue-resident macrophages and initiate inflammatory pain. EMBO J 2010; 29: 2290-2300. Kang TC, An SJ, Park SK, Hwang IK, Won MH. P2X2 and P2X4 receptor expression is regulated by a GABA (A) receptor-mediated mechanism in the gerbil hippocampus. Brain Res Mol Brain Res 2003; 116: 168-175. Li L, Zhang Q, Lai LY, Wen XJ, Zheng T, Cheung CW, Zhou SQ, Xu SY. Neuroprotective effect of ginkgolide B on bupivacaine-induced apoptosis in SH-SY5Y Cells. Oxid Med Cell Longe 2013; 2013: 11. Xiao J, Liu L, Zhong Z, Xiao C, Zhang J. Mangiferin regulates proliferation and apoptosis in glioma cells by induction of microRNA-15b and inhibition of MMP-9 expression. Oncology Reports 2015; 33: 2815-2820. Yu X, Pan Y, Ma H, Li W. Simvastatin inhibits proliferation and induces apoptosis in human lung cancer cells. Oncol Res 2013; 20: 351-357. Werdehausen R, Fazeli S, Braun S, Hermanns H, Essmann F. Apoptosis induction by different local anaesthetics in a neuroblastoma cell line. Br J Anaesth 2009; 103: 711-718. Arnoult D, Gaume B, Karbowski M, Sharpe JC, Cecconi F, Youle RJ. Mitochondrial release of AIF and EndoG requires caspase activation downstream of Bax/Bak-mediated permeabilization. EMBO J 2003; 22: 4385-4399. Tufek A, Kaya S, Tokgoz O, Firat U, Evliyaoglu O, Celik F, Karaman H. The protective effect of dexmedetomidine on bupivacaine-induced sciatic nerve inflammation is mediated by mast cells. Clin Invest Med 2013; 36: E95-102.